We keep our fields at PONY packed tight. 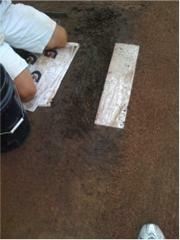 Water is meant to surface drain to the outfield and not absorb vertically. A puddle means there is a low spot. We do not want to make it worse! When a puddle exists, this is the best time to fix the problem. Doing this properly can prevent future problems and less work the next time it rains. Doing it improperly has the exact opposite effect. PLEASE DO NOT USE A RAKE! Use a large sponge (aka old couch cushion) that we have around the complex. Each field should have several in the shed. Place sponge in puddle and let it absorb the water. Wring out the sponge in foul territory our outside the fenced field area. Repeat until water is gone. Move material from higher/dry areas of the field into the moist wet areas. Tamp/roll, compress the new material. The moisture from the puddle will help the new dry material stick to the old material to create a solid base. ​You cannot force a field to dry! ​VERY lightly rake the surface of the dirt using only the weight of the rake to scratch the surface. You only want to concentrate on the top 1/4" of material. The deeper you dig, the more material you have to dry. ​Once you have 'scored' the wet areas, wait, be patient. Let the wind and sun do the work. ​The fields contain several tons of Turface. Turface is NOT a drying agent, it manages moisture in the field. There is enought Turface in each field so we do not want to add excessive amounts. ​Too much Turface in a wet area just makes it softer and harder to dry the next time it rains. ​Once the 'scored' areas show signs of drying, 'score' them again in the other direction, again, VERY LIGHTLY. 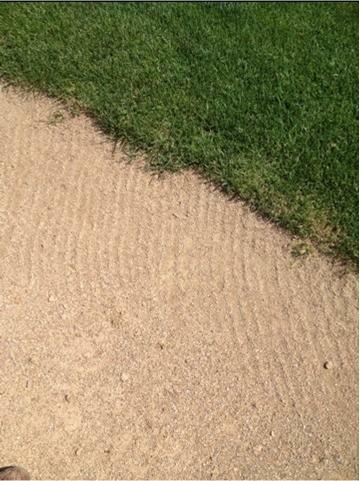 ​Continuing to rake and work a field is hard on your back and does not help the playing surface dry. 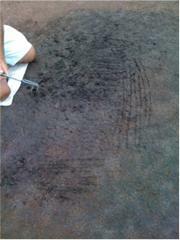 ​Once the surface is dry, pack/tamp the area using the 'end' of a rake, a tamper or a roller. 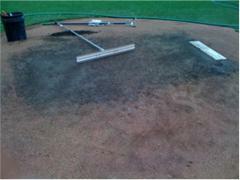 If the infield dirt sticks to any of these, it is too wet to work. ​This will help the area next time it rains. We do not want the fields to absorb water, we want them to shed water. The tighter the surface is packed, the better it will shed water. ​If the spot is "low" move material from higher spots of the field into these low areas using the back (flat) side of a rake. HOW TO FIX YOUR MOUND THE RIGHT WAY! Water is the key! Dry dirt doesn't form together no matter how hard you hit it or how you rake it. You must use water to patch your mound. From your 9U field up to the big league fields, the technique is the same. Wet down bottom of hole...do NOT make a puddle! ​WHAT IS WRONG WITH THIS APPROACH? Looks good, coaches took the time to hand-rake the grass edge of the field!! I apprecaite the help, however, this is an issue where more harm then good is done. Notice the rake lines are perpendicular to the grass. This is the FASTEST way to create a lip in the grass. You should always rake parallel to grass edges and NOT perpendicular. Moving the rake from the dirt to the grass throws dirt into the grass. The dirt quickly builds up and forms a lip under the grass.